I like using Siri on my iPhone but she mispronounces my name as well as the names of some of my French friends. Is there anything I can do to teach her to speak properly? You have a couple of options. The first is to deal directly with Siri (which I’ll refer to as “she” even though it can use a female or male voice). 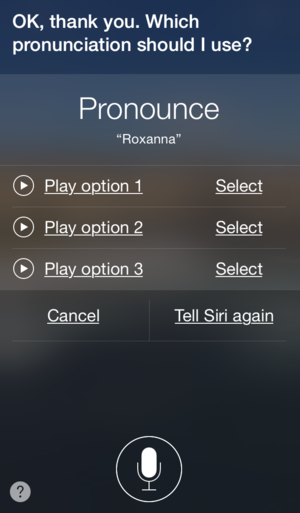 You can teach Siri how to pronounce a name. You’ll then be prompted to say the last name. Follow the same procedure. If that doesn’t work, open the contact within the Contacts app and tap Edit. Scroll down the screen and tap on Add Field. In the resulting screen tap Phonetic First Name, Phonetic Last Name, or Phonetic Last Name, depending on the name that Siri stumbles over. In the field that appears, enter a spelling that approximates the pronunciation you’re after. For example, if Siri pronounces your last name Lore-ent you’d enter Lore-ont. In some cases you’ll get closer by tapping on the keyboard’s Dictation button and pronouncing it the way you’d like it spoken. Tap Done and Siri should now pronounce the name correctly. Regrettably, Siri can’t be taught how to correctly pronounce place names.